The automotive market is at the centre of great global changes. The advent of start-stop systems is just one recent evolution in a constantly changing sector, which will soon find itself facing an even bigger development, such as eMobility. Power, dynamism and reliability are the key features required by car manufacturers. 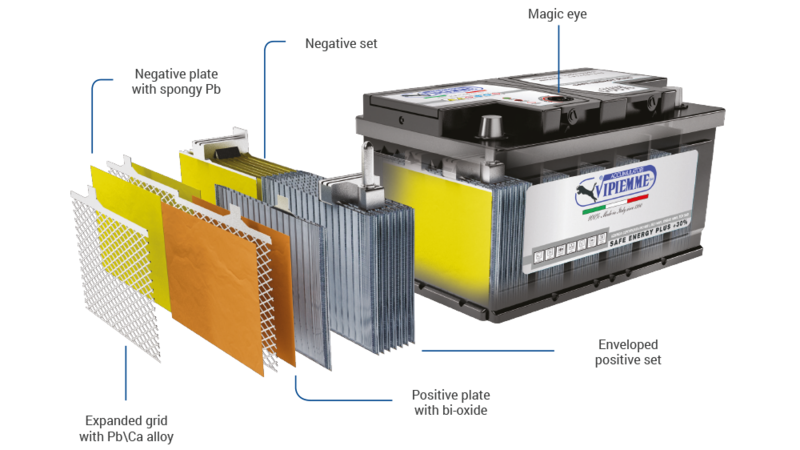 In order to meet all these numerous requirements, Vipiemme offers a wide range of batteries. 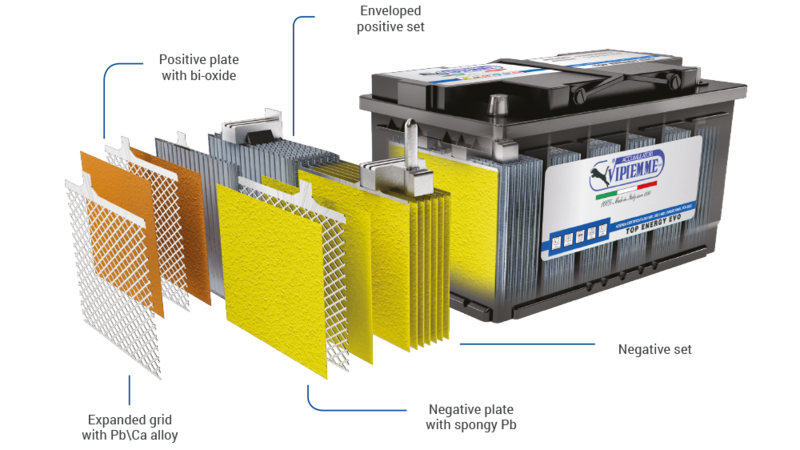 TOP ENERGY batteries are designed to meet the most stringent performance requirements of vehicles in use. These batteries have been developed to ensure an elevated spark in all conditions. This range in load version is made with expanded grid technology in Pb/Ca alloy. It minimises the effect of hydrolysis and consequently the consumption of water, while limiting the phenomenon of self-discharge of the battery. For all these factors, the battery earns its MAINTENANCE-FREE title. The lead used in the construction of the grids has a 99.99% degree of purity, and comes directly from the mines, which ensures a very high resistance of the battery to corrosion. The thickness of the positive plates is greater compared to standard technology. This choice has been made in order to ensure greater energy reserves and increased cycles, in order to meet the increasingly demand of on-board vehicle electronics. The HI-PERFORMANCE polyethylene envelope separator has a remarkable mechanical resistance, which guarantee against internal short-circuits. The explosion-proof tablet is inserted in the cover, with centralised degassing that minimises the possibility of explosions caused by the accidental emission of external sparks and flames. In addition, there is also greater security in sealing plugs with a smooth surface, to limit the possibility of opening by unskilled personnel. The SAFE ENERGY PLUS range is the improved version of the Top Energy range. The added value of the range lies in the double-lid that ensures the acid cannot escape from the battery in the event of overturning. Inside, there is also a “labyrinth”, which allows the condensation of the gases that develop inside during recharging. For this reason, water consumption is further reduced. The separator is made of HI-PERFORMANCE polyethylene envelope and has a remarkable mechanical resistance, which is a guarantee against internal short-circuits. Thanks to the new and unique grid design and the excellent charge acceptance, the battery guarantees high reliability in various conditions of use. The KATANA battery is designed for Asian car. 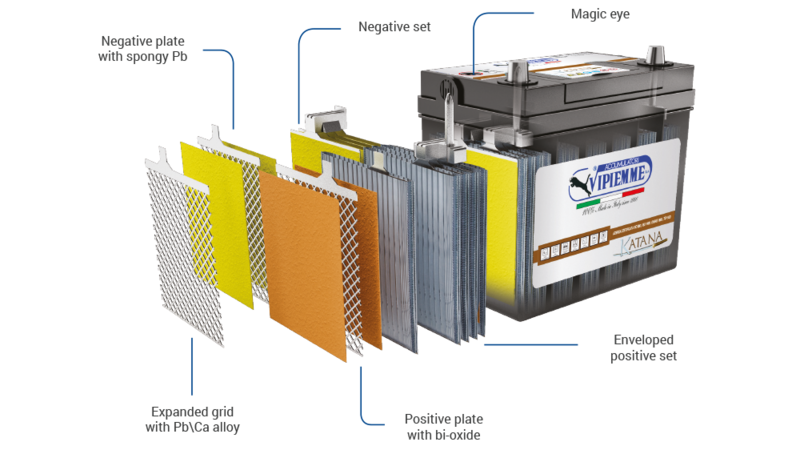 The batteries are built with both Pb/Ca and Pb/Sb alloy grids, all with a thickness greater than the standard, in order to meet the different needs of the market, such as: low water consumption, high resistance to corrosion and short-circuits, and low self-discharge in normal storage conditions in cool and dry places. The series is also equipped with an optical hydrometer device to control the electrolyte level in the battery. The latest addition to the range is the labyrinth lid that facilitates the condensation of gases formed during recharging. This feature arises from the desire to render the battery maintenance-free. The presence of an explosion-proof pad in the lid prevents external sparks or flames from entering within the battery and causing an explosion. The AGM batteries are designed for START and STOP applications and can be placed inside the cabin of the vehicle. They are built with the technology of grids fused in Pb/Ca/Ag alloy. A fibreglass separator is used to retain the acid in the battery. This technology allows the recombination in water of the gases that develop inside the cells. In addition, the gas cannot recombine immediately, being governed by the VRLA valve placed on the caps. The entire range of factors ensures that the batteries have a water consumption of zero, with the consequent MAINTENANCE-FREE characteristic. Other features of the range include high cycle resistance and very few problems regarding short-circuiting. The AFB battery is the latest trend in START–STOP motor vehicles. 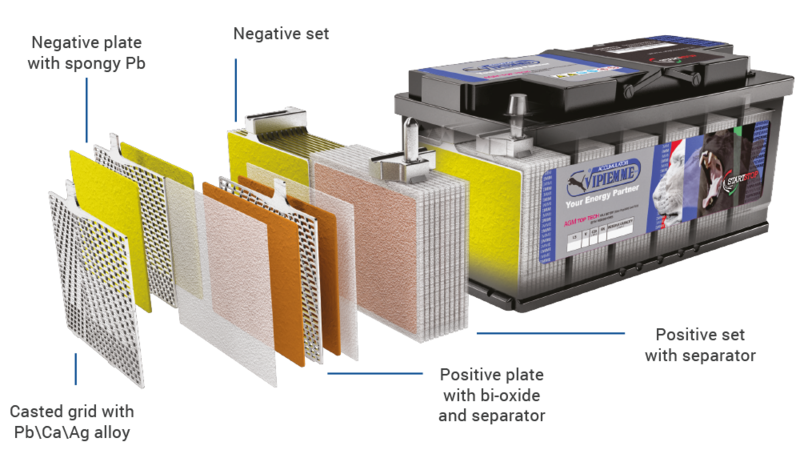 Automotive manufacturers aim for batteries with performances very close to those of the AGM, with a price just above the traditional varieties. 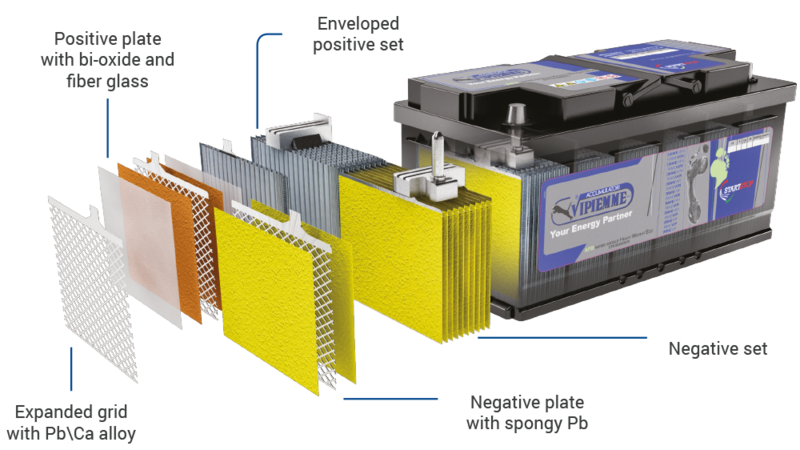 This is why Vipiemme has developed a further evolution in batteries, called flooded, which provides an improvement in cycles, water consumption and charge acceptance. This is all achieved by adding carbon to the negative plates.